California: Why Join a State Association? Feature: California: Why Join a State Association? California Land Surveyors Association maps the value of membership. These days, we are all trying to stretch a dollar. With greater demands on your resources you may be asking, “Why should I join my state association? What’s in it for me?” Benefits of association membership may vary, but one common purpose exists: the goal to strengthen the profession and ensure that it is viable for future generations. California Land Surveyors Association (CLSA) accomplishes this purpose, while adding tangible value for members. Dues for a licensed land surveyor in CLSA are $159 annually. What do members receive for their dues investment? Representation is an important member benefit; however, it is often overlooked because it’s not a direct, tangible value. Nevertheless, representation and protection of the profession are critical. Liaison Representation: CLSA represents the profession on a local, regional, and national level through our liaisons with organizations such as the state Board for Professional Engineers, Land Surveyors and Geologists (BPELSG), Western Federation of Professional Surveyors (WFPS), National Society of Professional Surveyors (NSPS), and the National Council of Examiners for Engineering and Surveying (NCEES). Legislative Advocacy: CLSA has an active legislative program with a committee of more than 20 members reviewing legislation as well as a legislative advocate (lobbyist) who keeps a watchful eye on the best interests of the profession. Over the years, CLSA has been instrumental in enacting legislation to advance the profession. One such success is expanding the surveyor’s right of entry to the California Penal Code as well as the Business and Professions Code. The surveyor’s right-of-entry is a privilege that CLSA is committed to protecting. To help education law enforcement agencies, homeowners, and the public about right of entry, we have developed an informational brochure for members. Public Outreach: Recently, CLSA has focused resources on representing land surveyors in the GIS community. Our brochure on the relationship between GIS and land surveyors serves to educate GIS professionals on the important knowledge, skills, and experience that land surveyors bring to the process of accurately creating and maintaining critical base layers common to many geographic information systems. Monument preservation has continued to be an issue in California. 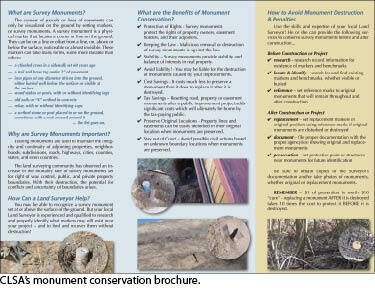 This year, CLSA developed a monument conservation brochure that provides information regarding the laws and regulations for preserving both horizontal and vertical control monuments. This brochure outlines the benefits of preserving these monuments and the cost one could incur if the monuments become lost and have to be reestablished. Networking and camaraderie are major benefits in trade association membership. Developing relationships among professionals can prove to be an invaluable benefit, and there is no limit on what a member can gain. It all depends on the individual member and how much he or she chooses to participate. Local Chapters: CLSA has 23 local chapters throughout California that hold monthly meetings, educational events, and social activities, providing members opportunities to network and further establish their standing in the professional community. Statewide Events: The annual conference, as well as workshops throughout the year, allow professionals from across the state to network and share information. Find a Surveyor: CLSA’s online “Find a Surveyor” search engine provides a valuable marketing opportunity that’s complimentary to CLSA members. Members can create an online profile, including company description and list of specialties, which is searchable by the public. While CLSA supports mandatory continuing education, California remains one of the few states that does not have a mandatory continuing education requirement. However, CLSA is committed to providing members with high-quality, affordable education to help them stay on top of important, ever-changing technology and current issues. Conferences, Workshops, Webinars: Each year CLSA hosts an annual conference providing more than 30 hours of education, including technical and business sessions. In addition, CLSA offers a variety of workshops throughout the year. To provide members with an even more convenient way to obtain education, CLSA and has just launched a new webinar series. Website: The CLSA website is a one-stop location for information for the survey profession. To provide added value for members, CLSA maintains a members-only section that includes current legislation, selected statutes, attorney general opinions, survey-related articles, and complimentary downloads such as standard contracts, exam guides, the Safety Tailgate Meeting Guide, and more. Ensuring the future of the profession is often a driving factor when considering whether or not to join an association. CLSA actively supports surveying students. Through its foundation and chapters, CLSA awarded over $45,000 in scholarships this year. In addition, students are provided the opportunity to network with professionals at our quarterly board of directors meeting and by volunteering at our annual conference. Those students who participate at the annual conference receive complimentary registration, room accommodations, and a per diem. This is an excellent opportunity for students to become familiar with the industry, network with surveying professionals, and create key relationships that will aid them in their future. CLSA has focused on increasing the stream of new people into the profession. To accomplish this we have developed a recruitment campaign with information on a career in surveying. In addition to printed material, CLSA hosts www.SurveyPath.org that provides resources for both students and teachers. In addition to the resources and intangible benefits such as those above, it is important that members receive tangible benefits, as well. If members take advantage of the discount programs provided by CLSA, it is clear the membership doesn’t cost—it pays! Below are a few of the discounts available to members. Insurance programs: Members receive discounts on professional liability, workers’ compensation, auto, home, long-term care, and disability. Office Depot: Members receive discounts up to 70% at Office Depot on office supplies, furniture, etc. Publications: Members receive a 50% discount on CLSA publications. Conference, workshops, webinars: Members receive substantial discounts on education: CLSA member price for an eight-hour workshop is $105, whereas the non-member price is $205. The success of an association depends on the membership. Financial support through annual dues is important, but even more critical is participation by members. If you are not already a member of your state association, join today and get involved! For more information on CLSA and member benefits, visit: www.CaliforniaSurveyors.org. Dorothy Calegari is executive director of California Land Surveyors Association.